The News team will be back on Thursday with some local and national news stories. Tune in at 6pm! If you missed our previous show covering the continued UCU strike action and Royal Holloway’s hard line response then listen on our Mixcloud. To keep up to date with news throughout the week then follow us on twitter. Spy poisoning: Russia stockpiling nerve agent, says Johnson. • Russia has been stockpiling the nerve agent used in the attack on an ex-spy and his daughter over the last decade, Foreign Secretary Boris Johnson says. • He also dismissed a suggestion by Russia’s EU ambassador that the agent might have come from a UK laboratory. • Vladimir Chizhov had said the Porton Down lab in Wiltshire may have been the source of the substance. 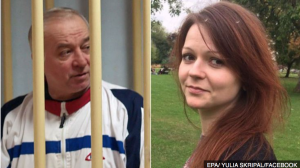 • Sergei and Yulia Skripal remain critically ill in hospital after being exposed to the substance in Salisbury. Sergei Skripal, 66, and his daughter Yulia, 33, are in a critical condition in hospital. Hundreds of nurses ‘hit by student loan errors’. • Hundreds of nursing students at 9 universities have been hit with errors in their student loan payments, the Royal College of Nursing says. • The students have been told they were mistakenly overpaid between £600 and £5,0000 by the Student Loans Company and to expect no more payments this year. • The letters came months after money was received and is leaving some students struggling to pay bills and rent. • The Student Loans Company said it was aware of the issues. Trump attacks ‘biased’ Russia enquiry. • Donald Trump has attacked special counsel Robert Mueller’s investigation into Russian interference in the US presidential election he won in 2016. • He tweeted that the inquiry was unfair – and reiterated there had been ‘no collusion’ between his election campaign and Russia. • He added that it was dominated by ‘hardened Democrats’ and supporters of his defeated opponent Hillary Clinton. • Mr Mueller, a highly regarded former head of the FBI, is a Republican. • The president’s comments came a day after his lawyer, John Down, said it was time for the special counsel’s investigation to end. Mr Trump’s latest tweet drew warnings from fellow Republicans about interfering with the investigation. Trump sacks US Secretary of State. • Sacked US Secretary of State Rex Tillerson has warned of Russia’s ‘troubling behaviour and actions’ in a parting statement after being fired by President Trump. • He failed to thank Mr. Trump or praise his policies. • The former ExxonMobil chief had a series of public riffs with the White House after being appointed last year. • Mr Trump officially fired Mr Tillerson via twitter, naming CIA Director Mike Pomepo as his replacement. • Speaking to reporters outside the White House on Tuesday, Mr Trump said his differences with Mr Tillerson came down to personal ‘chemistry’. 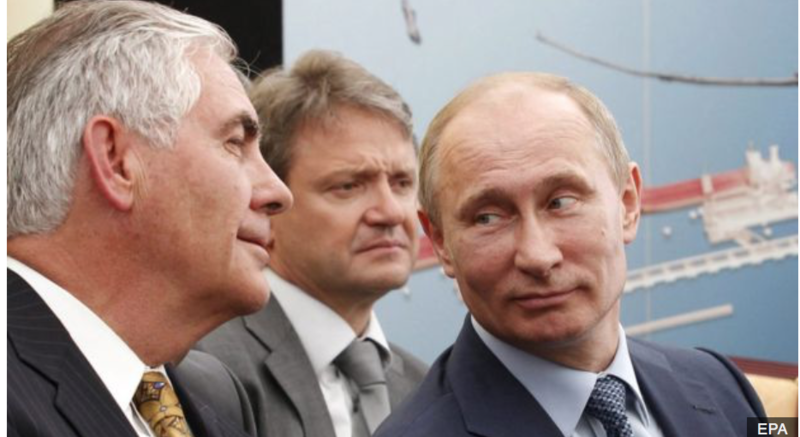 Mr Tillerson in his ExxonMobil days (L) with Russian President Vladimir Putin (R). CIA director Mike Pompeo has defended Donald Trump’s decision to meet North Korean leader Kim Jong-un, saying the president understands the risks. • Mr Trump “isn’t doing this for theatre, he is going there to solve a problem,” the spy chief told Fox News Sunday. • The president has said the summit could produce the “greatest deal for the world”. • But critics have warned that if the talks go poorly, the two nations will be in a worse position than before. • No sitting US president has ever met a North Korean leader. Russia election: Vladimir Putin wins by big margin. • Vladimir Putin will lead Russia for another 6 years, after securing an expected victory in the presidential election. • With most of the ballots counted, he had received about 76% of the vote, the central election commission said. • The main opposition leader, Alexei Navalny, was barred from the race. 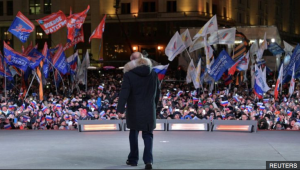 • Addressing a rally in Moscow after the early results were declared, Mr Putin said voters had ‘recognised the achievements of the last few years’. – Voting papers found in some ballot boxes before polls opened. – Observers were barred from entering some polling stations. – Some people were bussed in amid suspicion of forced voting. – Webcams at polling stations were obstructed by balloons and other obstacles. Mr Putin has been either president or prime minister for almost 20 years. 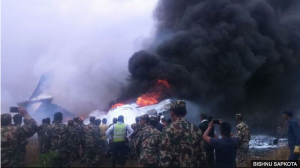 • The flight, carrying 71 passengers and crew, crashed while landing at Kathmandu’s Tribhuvan airport. • The crash killed at least 49 people. • The cause of the crash remains unclear, and an investigation is under way. It is the worst aviation disaster to hit Nepal in recent years. • It is now day 4 of the RH occupation of the principal’s office. • This is during the middle of an unsolved dispute between UUK and the UCU union in which academics have engaged in strike action. • This comes after proposed changes to the pension scheme in which academics could lose up to £10,000 per year in retirement. • As a result of no resolution to the dispute, students have taken to occupying the office of the principle, Paul Layzell. • There have been allegations of human rights violations to the freedom of movement and potentially breaching health and safety rules in regards to the closure of fire doors.